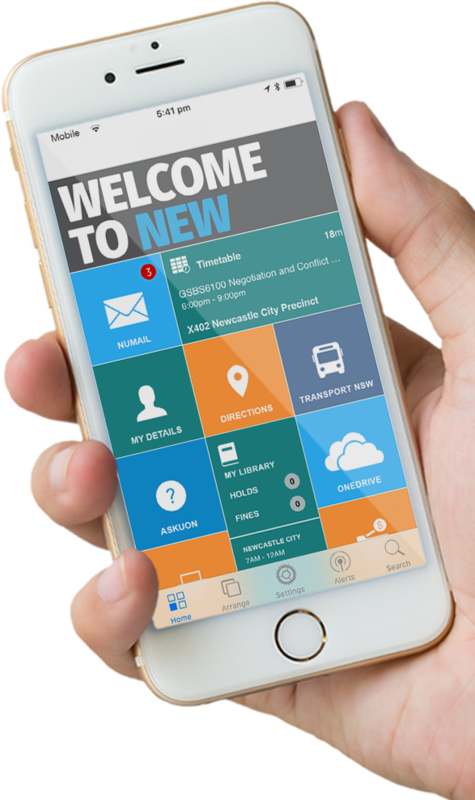 myUON is the University of Newcastle’s student App and portal, providing you with a centralised gateway to the most commonly used student systems and information sources. myUON is simple to use and can be personalised to suit what’s important to you. Personalised design – the App is designed to have everything you need at your fingertips. When you first download the App from the Apple or Google app store,all available services are represented by tiles. However, you are in control of what you want to view and you can customise this view on each device to suit your mobile, desktop or tablet needs. Automatic sign in – to save you time and effort logging onto the varying UON systems, the myUON App acts as a gateway. Being logged onto myUON means you are logged onto : UONline (including Blackboard, course materials and lecture recordings), MyHub, NUmail student email, AskUON, CareerHub, MyLibrary, UONPrint, Adverse Circumstances, Surveys and IT Support. Timetables – Click on the Timetable tile and myUON provides an easy view of your class and exam schedule, with the detailed view of each class linking to the Directions (MazeMap) – never be lost again! Keep on Track - The My Details tile gives you an overview of your student record. This makes it easy to check if your contact details are up to date or see if you have any academic or financial holds that require action. Keeps you connected – whatever you are into, the news and events banner has you covered with information about social events like bands, academic events such as guest lecture speakers, health services and well-being events,and more. Transport – whether you’re driving and need a park, want to connect with a rideshare,use public transport (bus or train) or simply using the courtesy shuttle between Callaghan and the Newcastle city campus, the transport tiles will keep you moving. There are loads of other great features including PC seeker to find an available computer near you, MyLibrary for quick access and information on your library account and more… download and get exploring! myUON is available as a mobileApp or web portal.The portal can be accessed online at myuon.newcastle.edu.au, or download theApp – available on iOS and Android from the app stores.